Earth's surface is always changing, and the polar regions are no exception. Glaciers slowly scour the landscape, while the fierce katabatic winds of Antarctica create unusual rock sculptures. Just off the coast of Antarctica, Mt. Erebus erupts almost daily. In this issue, we highlight lessons in which students model the forces that shape and change Earth. Our Feature Story, "The Heart of Erebus," teaches students about Antarctica's active volcano while the associated templates provide support as they identify facts, ask questions, and make connections with nonfiction text. Photo: Aerial view of Mt. 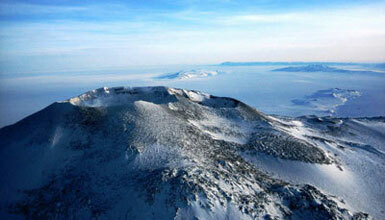 Erebus crater, the southernmost active volcano in the world. Photo courtesy of Christopher Dean, National Science Foundation.